Just got a copy of Windows 7 and you're looking to bend it to your will? Then you'll want a copy of Windows 7 Manager ($40, 15-day free trial), which lets you tweak, customize, master and improve just about every aspect of Windows 7. Whether you're looking to tweak security, improve optimization, clean your system, master your network or more--and whether you want the 32-bit or the 64-bit version--you'll find something here. Yamicsoft's Windows 7 Manager lets you tweak just about every aspect of Windows 7. Though it covers a lot of territory, everything is laid out cleanly in Windows 7 Manager. Click what you want to improve, such as Security, Network, Optimizer, and so on, and you'll come to a screen full of options. In some cases you won't need to know anything about the innards of Windows 7, because sets of wizards guide you through the task. In other instances, you'll need to have some technical background, because you have to make choices among check boxes--for example, if you want to accelerate your network connection, you'll need to understand terms and technologies such as Maximum Transmission Unit (TMU) size, TCP/IP Timeout Life (TTL), and "Enable SackOpts." The amount of control Windows 7 Manager gives you is extraordinary. Want to change the mouse hover time before a pop-up displays? You can do that. Want to manage what programs run at startup? You can do that as well. You can also repair hardware and software problems, optimize your broadband connection and more. The same developer makes a similar program for Windows Vista, called Windows Vista Manager, which looks and works very much like Windows 7 Manager. 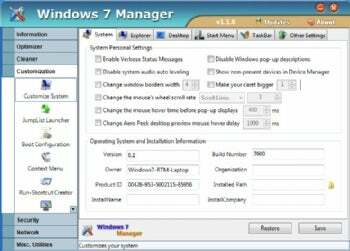 Anyone who used Windows Vista Manager will very easily make the switch to Windows 7 Manager; the interface and functions are very similar. The program doesn't come cheap, though. You'll most likely only want to pay for Windows 7 Manager if you want to do a great deal of customization.